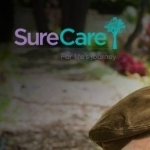 SureCare teams across the country can offer live-in care to people from all walks of life and we're proud to support their care requirements, whatever the situation. Our development of Home Services came about after taking on board feedback from clients and their friends and families. Since then, we've been happy to provide assistance for a variety of tasks to help with differing living situations. From the older person continuing their independent living, to busy parents trying to maintain a healthy work/life balance, we've got you covered. We also encourage all our customers to come to us with any suggestions or other feedback on services we can help with. We're happy to listen to you about your specific needs and we'll do our best to support you however we can. Flexible care cover for when your regular carer needs a break. We're an award-winning provider of Dementia and Alzheimer's care. At SureCare, we're committed to improving the lives of people affected by dementia and associated conditions. Our care workers are specially trained to provide high quality care to those suffering from dementia or Alzheimer's disease, while providing a safe, stimulating and social environment. Across our network we understand just how difficult it can be caring for someone with dementia. That's why we're extremely proud that our unique approach has resulted in SureCare receiving the Dementia Initiative Award, in which our services were praised for. Alzheimer's disease and other forms of dementia already affect 1 in 14 people over the age of 65, and cases are rising on a global scale. We know it can be a worry making sure your loved one receives the right care and attention they need, especially for what can feel like an isolating illness. If your loved one suffers from dementia or Alzheimer's disease, don't hesitate to get in touch, so we can discuss your specific requirements and provide a carefully tailored service. Compassionate end of life specialist support. End of life care aims to provide support to someone in the later stages of a life limiting condition to live as well as possible until they die. Our fully managed End of Life Care Solution enables our client to spend the final days in their chosen environment and pass away peacefully, with dignity and surrounded by love ones. A variety of childcare services to support your busy lifestyle. We recognise that different children may have specific, individual needs and we welcome any suggestions for other services we can provide. It's our aim to be as flexible as possible to put you first. Home care (also known as domiciliary care) provides a wide range of services to help individuals who choose to remain living in their own home, safely and securely as possible. Our staff can carry out a number of household tasks, designed to help keep your home safe, comfortable and welcoming.